Alcohol consumption is a root cause of high blood pressure—also called hypertension. Excessive alcohol consumption has long been linked to health problems like depression, cirrhosis of the liver, psoriasis, nutrient deficiencies, diabetes, and heart disease. It turns out that binge drinking during young adulthood may also lay the foundation for hypertension when you get older. In a new study published in the Journal of Adolescent Health, researchers from the University of Montreal in Canada suggest that regular binge drinkers in their 20s have higher blood pressure. As a result, they have a greater risk of getting hypertension later in life. Pre-hypertension has a systolic blood pressure reading of 120 – 139 millimeters of mercury (mm Hg), and a diastolic blood pressure read of 80 – 89 mm Hg. Systolic blood pressure is the measurement of the artery pressure when the heart muscle contracts, while the diastolic blood pressure is the measurement between beats when the heart is resting. For the study, the researchers observed the alcohol consumption data of 20-year-olds who participated in the Nicotine Dependence in Teens study, which is a cohort of young smokers from different social backgrounds residing in the Montreal area. All participants had their alcohol consumption rated at the beginning of the study. Drinking consumption levels were also measured again four years later, along with systolic blood pressure levels. The researchers found that the blood pressure of young adult binge drinkers between the ages of 20 and 24 was 2 to 4 mm Hg higher than those who didn’t binge drink. What’s also alarming is that 85% of the 20-year-olds would drink heavily until age 24. The research team has received the funding necessary to follow and examine blood pressure and drinking habits of the study participants until the age of 30. This follow-up is thought to help uncover whether blood pressure increases in people who don’t stop binge drinking. The researchers also hope to find whether blood pressure will return to normal levels when drinking habits improve. 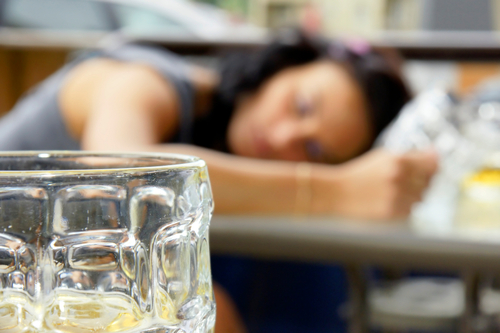 Binge drinking is considered the most common pattern of alcohol abuse. Binge drinking is typically classified as women who consume four or more drinks and men who consume five or more drinks in a two-hour timeframe. According to the Centers for Disease Control and Prevention, one in six American adults is thought to binge drink four times per month while consuming an average of eight drinks each time. In general, binge drinking is more common in young adults aged 18 to 34-years-old; however, it can also occur in adults over the age of 65. Studies have also found that drinking at a young age can promote behavioral and memory changes that can lead to future drinking habits. Essentially, the perceived high feeling from alcohol is similar to other abused drugs like cocaine. A single alcoholic drink will affect the neurochemistry and neuronal activity of the brain. It is important to keep in mind that proper nutrition is vital at any age, but especially among heavy drinkers. People who have a history of binge drinking would benefit from a low-glycemic diet with lots of vegetables. People who depend on alcohol should also consider foods high in zinc, selenium, vitamin A, vitamin C, magnesium, and essential fatty acids. Wellman, R.J., et al., “Relationships Between Current and Past Binge Drinking and Systolic Blood Pressure in Young Adults,” Journal of Adolescent Health, March 2016; 58(3): 352-357, doi: 10.1016/j.jadohealth.2015.10.251. Beckley, J.T., et al., “The First Alcohol Drink Triggers mTORC1-Dependent Synaptic Plasticity in Nucleus Accumbens Dopamine D1 Receptor Neurons,” Journal of Neuroscience, 2016; 36(3): 701, doi: 10.1523/JNEUROSCI.2254-15.2016. “Fact Sheets – Binge Drinking,” Centers for Disease Control and Prevention web site, last updated October 16, 2015; http://www.cdc.gov/alcohol/fact-sheets/binge-drinking.htm, last accessed February 22, 2016.